Yes, I am a follower of Jesus. I believe the truth contained in the Bible and in THE TRUTH who is Jesus Christ. 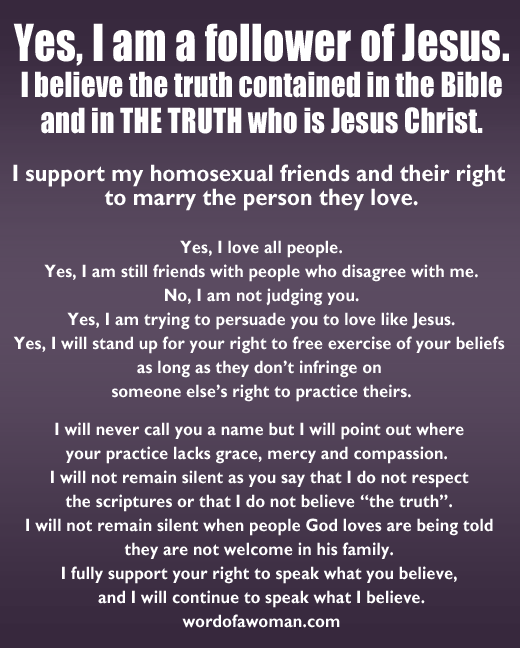 I support my homosexual friends and their right to marry the person they love. Yes, I love all people. Yes, I am still friends with people who disagree with me. Yes, I am trying to persuade you to love like Jesus. Yes, I will stand up for your right to free exercise of your beliefs as long as they don’t infringe on someone else’s right to practice theirs. I will never call you a name but I will point out where your practice lacks grace, mercy and compassion. I will not remain silent as you say that I do not respect the scriptures or that I do not believe “the truth”. I will not remain silent when people God loves are being told they are not welcome in his family. 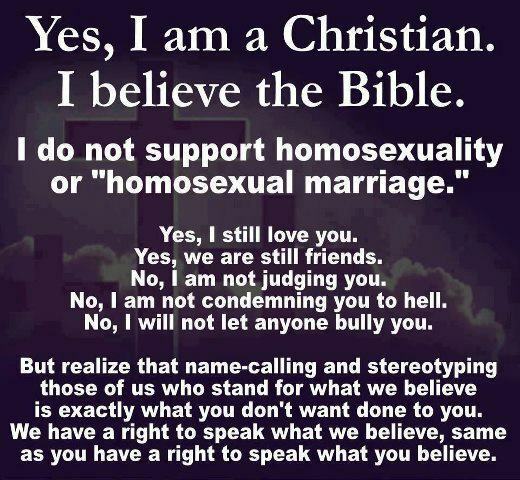 I fully support your right to speak what you believe, and I will continue to speak what I believe. * Due to demand I turned this into a meme of my own which you will find below. Please feel free to share it. Nice response…my thoughts exactly! You should make yours into a similar meme! My response to the meme is that the proponent has the right to express belief, but not to oppose equal marriage: because that is trampling on my rights. Love this! You’ve basically said exactly what I believe, to the point where when I read this on the Facebook page Christians Tired of Being Misrepresented, I felt as though it was my own voice reading it. Thank you!